One of the things we love so much about current funeral practices is the ability for famlies to have so much choice around almost every aspect of a funeral. Here at State of Grace we offer a wide range of vessels for cremation, from the simple honesty of the cardboard coffin right through to our lovely David Trubridge pod, with many other choices in between. We have been lucky enough to have the gorgeous silk shrouds designed by Miranda Brown and one of our familes recently created the most stunning farewell for their Mum using the shroud. Joy Fraser, whose Mum – Beryl – had died, organised most of the funeral herself and even acted as the celebrant at the service which was more of a family gathering, sharing stories and lovely memories with Beryl lying in state in her beautiful shroud. Beryl had loved her garden, so Joy decided to create a garden around her. 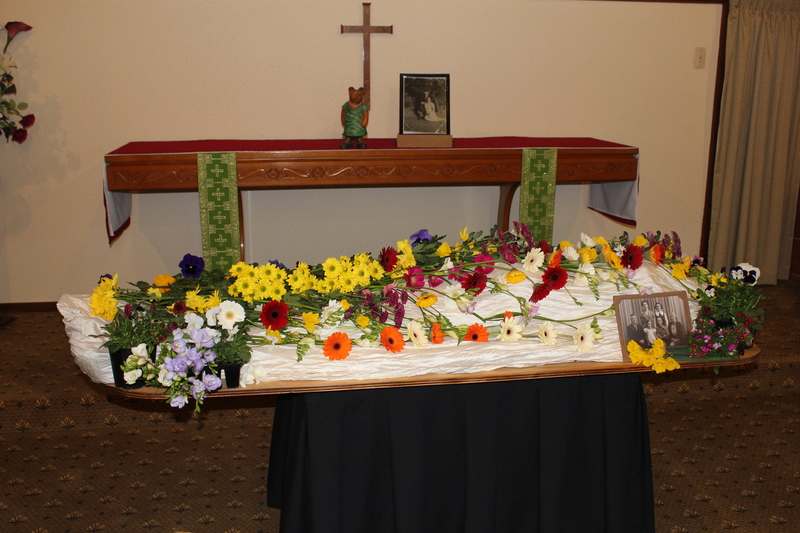 You can see from the photos (generously shared by Joy) that Beryl was indeed lying in a bed of flowers. We thought it ws so beautiful that it had to be shared and Joy was only too happy for us to tell you all about it in the hope that it may provide some inspiration.